Spring is in the air, which means I’m busting open my windows, vacuuming out my dusty corners, and lamenting the return of the almost-ever-present Louisiana mosquitos. But seriously. The smell of the first lawn-mowings of the season drifting through my open windows is one of the very best things in the whole world and just makes me want to clean my house! I’m sharing 5 of my favorite cleaning/household items. For the record, I do actually use a lot of vinegar for cleaning (I know at least 42 of you are itching to share 563 household uses for vinegar)–I pour it down smelly drains, use it to clean glass, add it to my laundry, use it to clean my dishwasher, and use it to clean fruits and veggies. Among other things. But. I’m not talking about vinegar today (well, clearly I am a little). Today, I’m sharing 5 of my favorite must-have cleaning and household products. Not including vinegar. 2. Tide Pods. In the spirit of full disclosure, not only does my husband work for Procter and Gamble, and not only does he work in the laundry division, but he’s also in the Pods business. But. Even if he didn’t work for them, even if his relationship with P&G went up in flames in terrible, terrible ways, I would buy Pods. They keep me from over-detergenting my laundry, they work great, and they smell amazing (also, the purple Gain Flings smell like heaven). Plus, they’re super convenient for travel, college students, if you use a laundromat, etc. Yes, there are horrible stories of children eating them. Just like any other chemical, keep them out of reach of your kids and don’t let kids help you with them until they’re old enough to know not to eat them. 3. Thrift. This isn’t actually a cleaning product, per se, but this is a must-have at our house. You can order it from Amazon or find it at a local plumbing supply store (I’ve never seen it at a big box store like Lowe’s or Home Depot–you’ve gotta go where the plumbers go for this.) We used this all the time in our college apartment managing days and while $10-11 seems like a lot for a bottle of this stuff, it’s significantly cheaper than a plumber and works better at clearing drains than any other product I’ve ever tried. It only works on organic material, so if you have, say, a toothbrush in your toilet (waving to my darling two-year-old and remembering that time not too long ago we were replacing a toilet at 10:00 pm), it’s not going to do anything for you. But hair in the shower? Kitchen sink smelling musty and you think something is trapped in your garbage disposal? This will take care of it almost instantly. Just a warning, these are serious, hard-core chemicals, so you want to keep it locked up and out of the reach of children. Also, wearing a mask while using it isn’t a terrible idea. 4. Mrs. Meyer’s. I’ve posted about Mrs. Meyer’s before, but I love, love, love these products, especially the all-purpose cleaner and the dish soap. I also love the hand soaps (although I find them a bit drying during the winter months; I don’t notice it during the warmer months)–there are a few scents that only come in the hand soaps. The rhubarb and parsley and both to die for, especially for the males in your house that don’t like smelling like sunflowers, and the watermelon and apple both smell like their respective Jolly Rancher flavors (which for me is something dreams are made of.) For the all-purpose cleaners and dish soaps, I’m currently crushing on basil, radish, and lavender. 5. Blue Magic Carpet Stain & Spot Lifter. I have 3 kids, 2 dogs, and a cat. I need something that gets stuff out of stuff. I’ve tried ’em all and this is hands-down my favorite–I use it on carpets, rugs, car upholstery, furniture upholstery, everything. It doesn’t foam up (it’s not soapy at all) and the stains really do just kind of lift out. The best place to get it is Walmart (I know)–it’s just not really widely available, which is a huge bummer. But that means you can spend $3.88 at Walmart or $12.98 at Amazon. So that’s it Happy cleaning, everybody! Thanks for the tip about using Bar Keepers Friend on your Le Creuset. I’ve always used it in my sink, but never thought to use it on my cookware. My pots and I thank you! I have to admit that I thought the whole laundry detergent pods thing was a sham, until I bought some because they were on a super sale plus I had a coupon….and I really do feel like they save money because you use the proper amount of detergent. It doesn’t seem that hard to measure the liquid (and it’s not really…for me), but I think that my husband was using A LOT of detergent (I know, I should just be happy he’s doing laundry right?…except that he never FOLDS any laundry or PUTS IT AWAY, or even takes it out of the dryer for that matter, and then he acts all proud of himself for “doing laundry”…but I digress), and we seem to be going through a lot less with the premeasured pods. I’m sold! Also, I love that you made detergenting a word. HA! I loved your rant about your husband ‘doing laundry’ – totally know what you mean! Yes, this laundry rant was fantastic, hahaha! Yes!!! The other day I was so sick I could hardly get out of bed so my husband “helped” me by doing laundry. Meaning he threw a load that I had already sorted the night before into the washer. That’s it. So when I felt better a couple of days later I had a nice damp, musty load of colors in my washer. So helpful! Ha ha! Men and laundry! Mind does weird things like put every stitch he owns in with the sheets and towels, which I don’t find out about until I’m pulling the wet stuff out to hang. Why did you do that? (shrug) What? I guess I need to pick up the habit of looking inside the washer before I load it up. I have never heard of Thrift, but I’ll have to get some. I don’t know why, but every drain in our house gets clogged so easily. Most of the time it is just gunk in them – except the time that a stupid crayola toddler bath crayon (you know, the ones that are really fat to fit in a toddler hand) got flushed into the toilet. We had no idea what was wrong, so we called a plumber and he came out and tried to snake it. In the process, completely scratching the crap out of the toilet. After a while, he gave up, took the toilet off, and found the crayon that way. Bar Keepers Friend did take care of the scratches in the toilet though! So excited to hear about Bar Keeper’s Friend! My stainless steel pans could really use it, and the discoloration of my enamel dutch oven pan is driving me crazy. So glad there’s a fix for it! Love this list! Has anyone heard about the plastic from the laundry pods not fully disintegrating and then getting stuck to your clothes and ruining things? It happened to my friend – but I’m not sure which brand she used, though. Anyway, I’ve hesitated to use the laundry pods but love the Cascade ones for my dishwasher! My friends little girl ended up eating part of a pod because it didn’t fully disintegrate and she ended up finding it in the basket of clean clothes. It was really scary, because most people realize the container of pods needs to be stored away from children, but you don’t think about a basket of clothes about to be folded. I think this is really rare, but something to be aware of as a possibility. good ideas!! whatever happened to the fit club? Hooray for Bar Keepers Friend! I just bought some to try out on a slightly scorched sauce pan (fingers crossed), but now I’m going to try it in my crockpot. I use it to cook beans all the time so it has that permanent bean grunge no matter how much I scrub. Thanks for the Blue Magic recommendation, too. I’ll grab some next time I go to Wal Mart. Thrift is pure lye, just like the granules type Draino. Extreme caution when using these products but they do work well. Please do a little research about using lye and believe and follow the correct handling. Lye granules will ‘hop’ around on dry surfaces when pouring out of the container, so before opening and pouring (carefully) use a dry fabric softener sheet to wipe down the container/lid or counter or measuring cup. It helps control the granules. If you get a splash on skin, rinse well with tap water then douse with vinegar to neutralize the lye. Always wear some type of eye protection when handling lye from start to final flushing. Treat it with respect. Thanks for the tip about using Bar Keeper’s Friend on enamel cookware! I had been wondering what to do about the scratches on my Le Creuset knock-off. My mom has sold me on the laundry detergent pods, although she buys the Costco brand (sorry!) I’ve been doing laundry at her house since my (ancient, tiny, dryerless) washer died. I will treat myself to Tide Pods when I move into my new house with the beautiful new washer and dryer – which I’m way too excited for. Have you ever tried Thrift in a smelly dishwasher?? I don’t know about the other products, but I can definitely attest to the value of “Bar Keeper’s Friend”. I grew up using “Bon Ami”, but BKF is even better. I am a big fan of Bar Keepers Friend. It saved my copper bottom pot when I thought I’d burned it up on the stove. Looks like new! I use it on several things. It’s also good for soap scum build up on a shower door! Another product that I recommend keeping handy is a bar of Fels Naptha soap. It lasts forever, costs about $1 in the store, and gets laundry stains out like nobody’s business! I know many people grate it and use it in homemade laundry soap. I just keep a bar by the sink and scrub out stubborn stains before laundering. Good stuff! Thanks for sharing! I am always looking for new cleaning products to try. 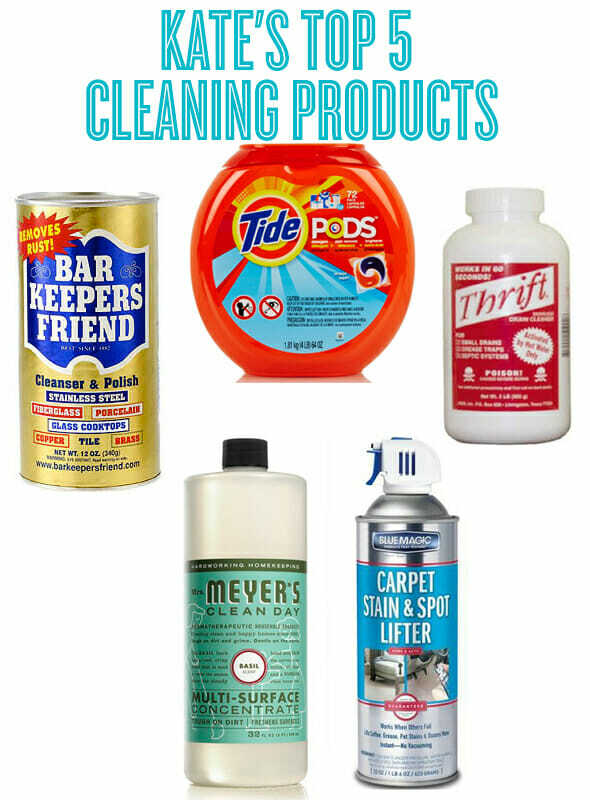 I also really like Mrs. Meyer’s cleaners and as I also have a dog, a cat and a kid the Blue Magic Carpet Stain & Spot Lifter is really helpful! 🙂 Thanks for sharing!